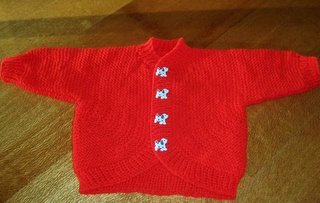 Grandma's Knitting Place: Catching up on Knitting for Christmas Gifts among other things! Catching up on Knitting for Christmas Gifts among other things! 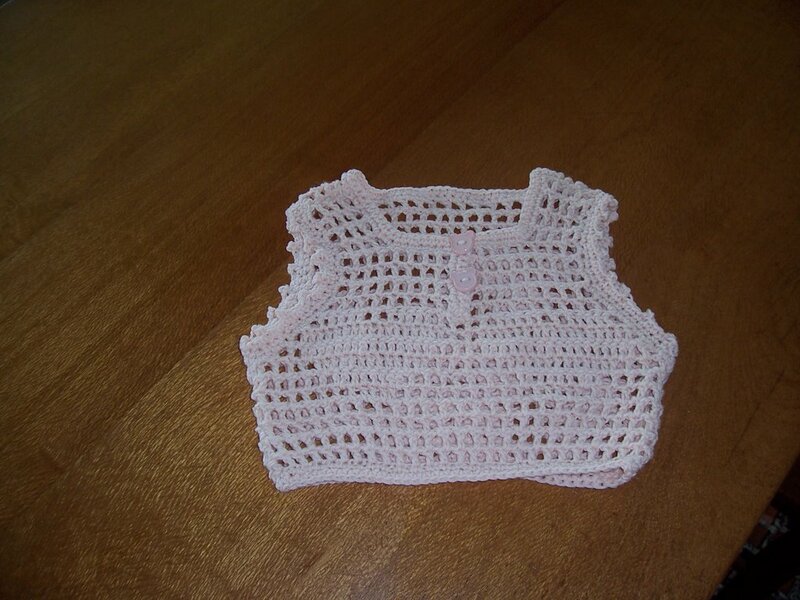 This little gem is the Beribboned Eyelet Sweater, from the Kids , Kids, Kids pattern book. 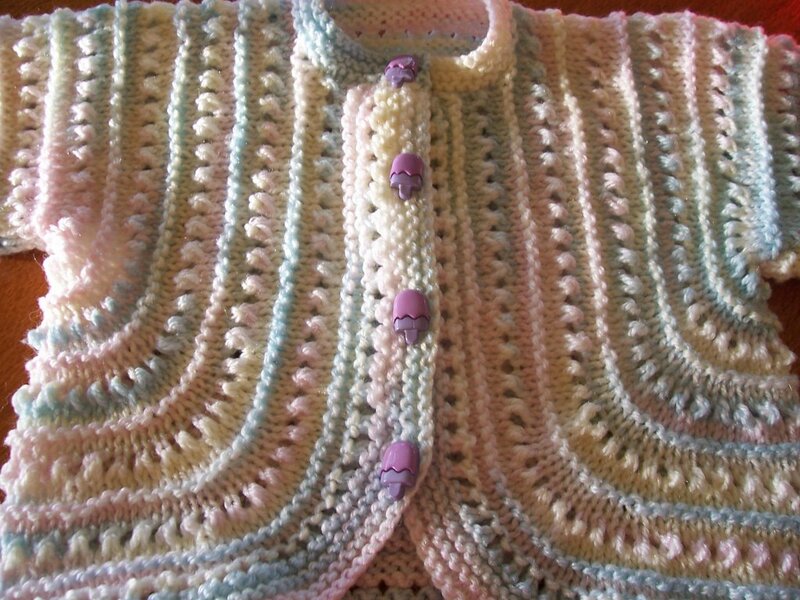 I made it as part of the Knitalong held recently on Babysweaters Group on Yahoo. The yarn is TLC Nap Time and the sweet popsicle buttons are -once again - from daverun on eBay - my favourite button seller in the world! 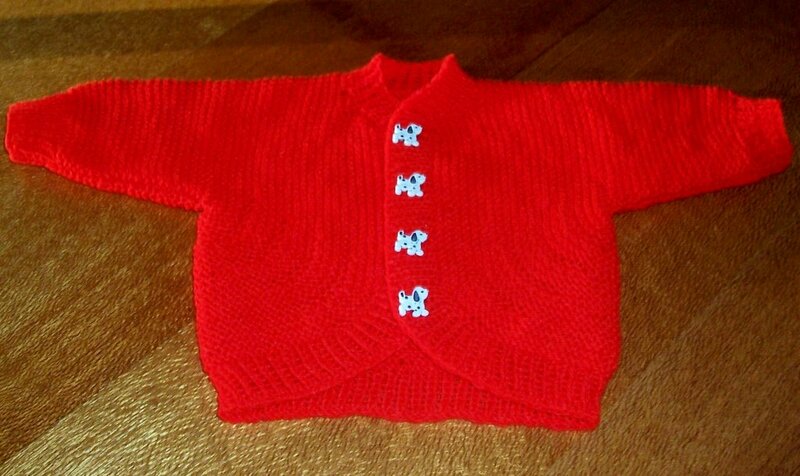 I love this little sweater and have made many. However, it is very girly and I thought I would tweak the pattern and change it to a more boy- like version. So I came up with a totally different look - all in garter stitch. Check it out! Yes it is the same basic design - but I changed the shaping method slightly, gave it a ribbing cuff and devised a ribbing band that went all the way round in one piece instead of having a separate neck band. And the buttons again, are adorable - little dalmatians - from daverun of course!! I have no affiliation with Dave Rundell, I am just a very happy and satisfied customer. I have sent him these pics of his buttons on an actual garment. This really nice sweater for Christmas for my daughter Simone - made in of all things, Twilley's Bulky Capricorn! Now discontinued - but eBay is a wonderful place to buy it still! She lives in chilly Toowoomba where they have bitter winters, being right on the Darling Downs, and so she needs the odd bulky cozy sweater. The basque and cuffs are in Disco 8 ply acrylic. Yes I use acrylic - and love it - the last time I made this particular sweater for Simone, I made it in the most gorgeous soft pure wool and the moths destroyed it! 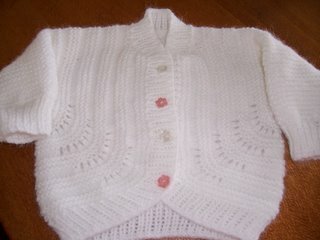 It is a long time since I made an adult size sweater - after making baby things for so long it was a shock!! Seemed to take forever! 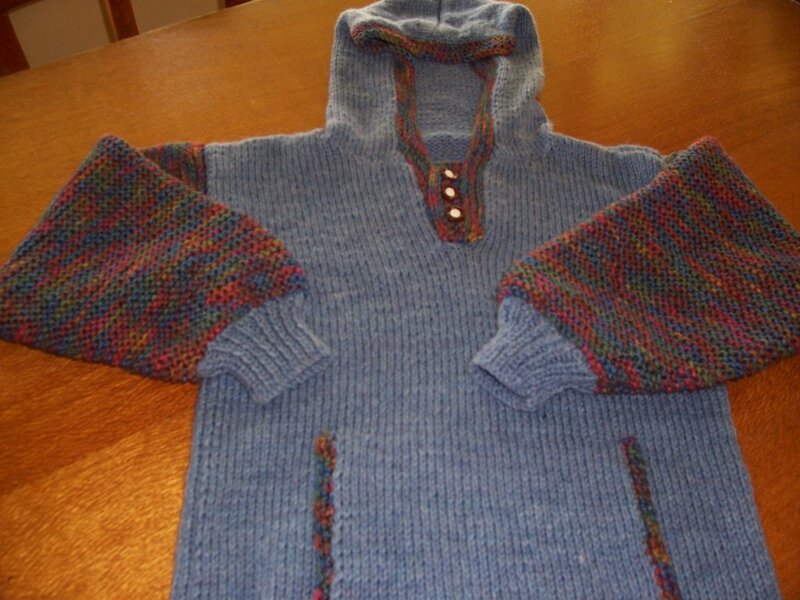 This little hoodie is a Christmas gift for Simone's son Tom - my beautiful grandson, aged 6-1/2. The body is a denim DK from England I can't remember the name of, the sleeves and trim is Red Heart Super Saver in Fiesta Jewels. I have since found out from his Mum that he is into mittens - so I shall hunt out the sideways mitten pattern from Mariella - from Knitbabysurprise group or Babysweaters - both on Yahoo. Will make them in the Fiesta Jewels too. Another little Christmas gift - this time for 6 year old Caitlin - I have made this one before - this time I had to size the pattern down because I had 6 skeins of Bernat Club Soft that dear Marilyn in SE Texas gave me some time back. 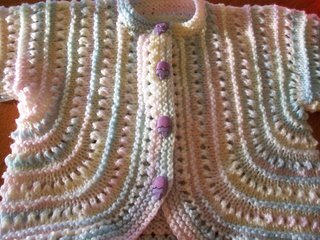 It is much thicker than the pattern called for - after several attempts I finally got the downsizing worked out - phew! All that math! The pic doesn't really do it justice - it is a pale apricot colour and the teddy bear buttons match exactly. 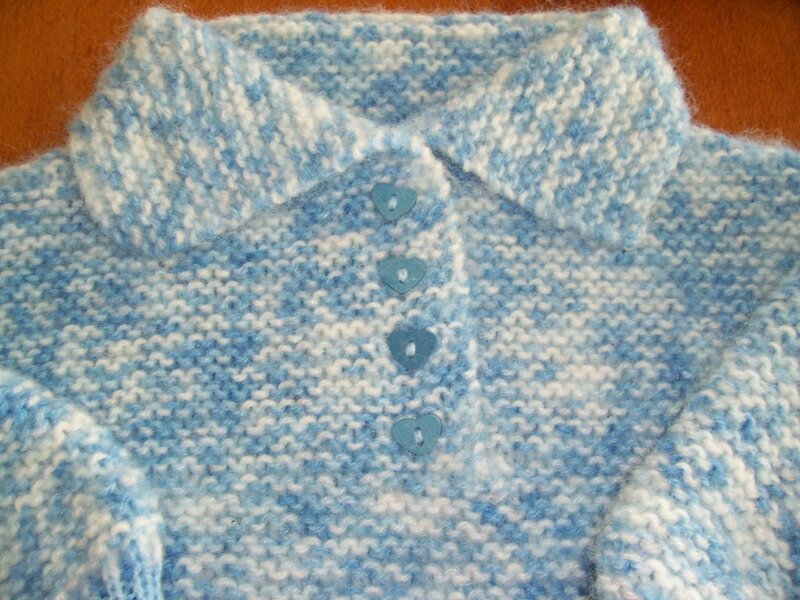 Here is another version of the Beribboned Eyelet Sweater - suitable for boy or girl - I used the same 8 stitch shaping under the armholes, used the Wager Welt 8 row pattern and made a ribbing band all the way around again. It came out so cute! The yarn is Angoretta by Panda - the softest nicest acrylic in snowy white - and wouldn't you know it? Discontinued! But EBay to the rescue again! Missed out on 10 skeins of it in delicious pink the other day - boo hoo! Still working away at finishing Christmas gifts!! 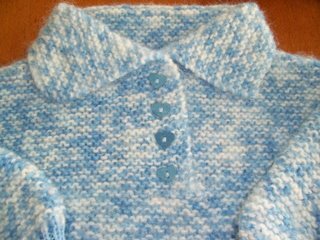 Won't it be lovely to get back to knitting at my leisure instead of to a deadline?? 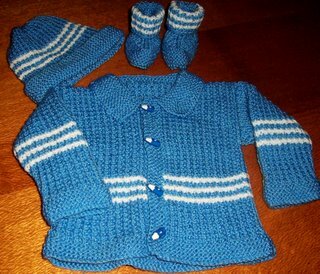 Finished this little set for charity though - have to think of my homeless babies too! 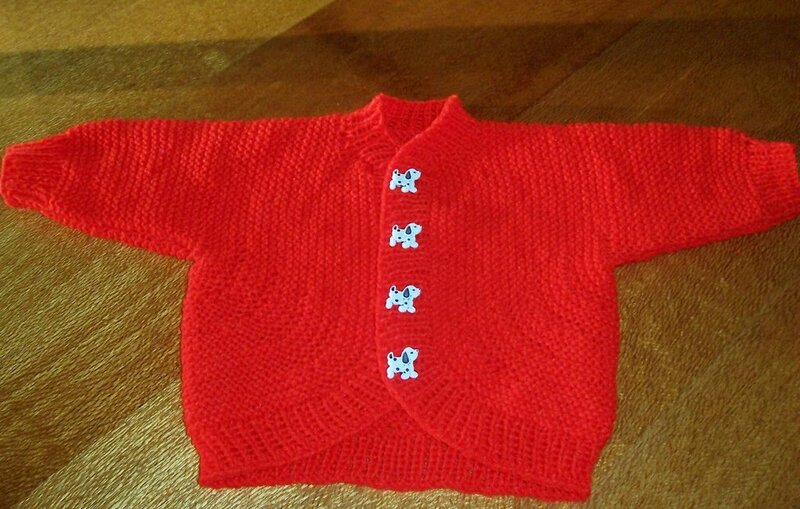 All made in Disco 8 ply - the Jacket and the Hat are from a Red Heart Leaflet called Baby Talk. The boots are from a free pattern on Bevscountrycottage.com - Michelle's preemie booties. Knitted in a bigger yarn they are so simple - just done on two needles, and one seam only down the back and along the sole - if you made on circs or dpns they would have no seaming at all - because you could do a three needle cast/bind off.The buttons are gorgeous little blue and white pencils - from daverun of course! Well back to the knitting - Grand daughters Lauren and Samantha have two Christmas gifts that have to be finished, DIL Cathy's Christmas Sweater is waiting for second sleeve, sewing up and neckband - son Richard's Sweater isn't started yet - but thankfully, we are not seeing them till 16th January - so some breathing space there! I will get it all done by then I know! Thank goodness I am a fast knitter! What beautiful sweaters you have made! I love the Beribboned baby sweaters! Merry Christmas! Oh I love all your baby sweaters! 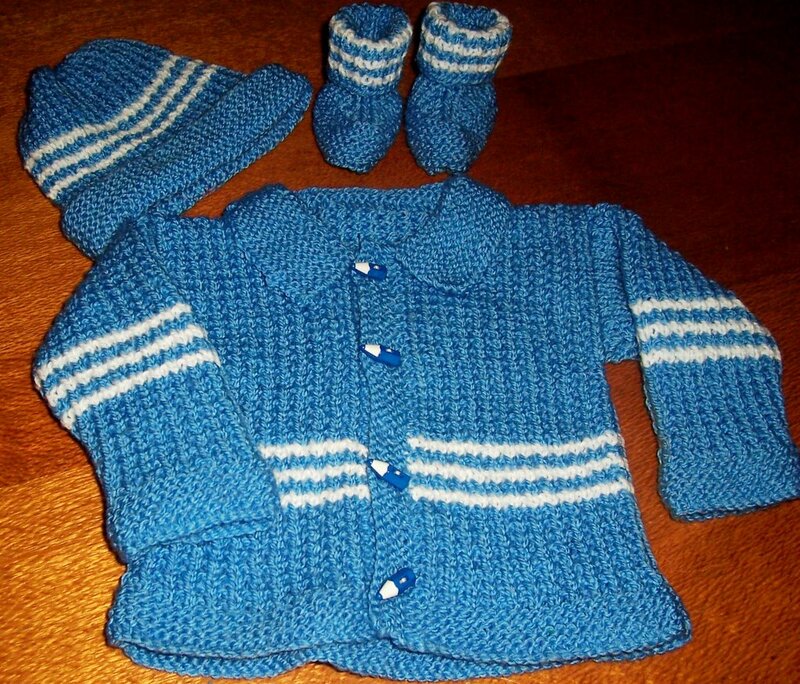 I think knitting things for babies is the most fun.